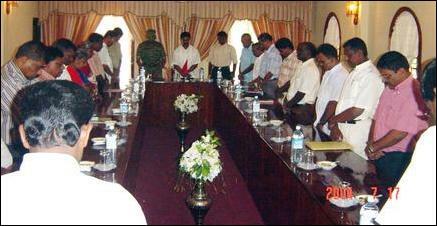 Batticaloa-Amparai Tamil National Alliance parliamentarians met with LTTE Head of Political Wing, S.P.Thamilchelvan in the LTTE Peace Secretariat premises Saturday morning, source in Vanni said. 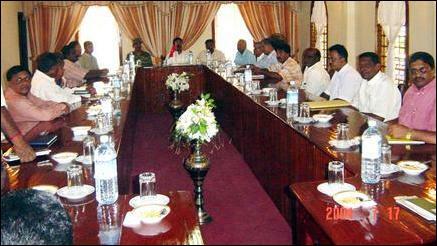 Matters related to currently prevailing situation in Batticaloa district were the focus of the discussions according sources. Batticaloa parliamentarians Joseph Pararajasingham, P.Ariyanenthiran, T.Kanagasabai, S.Jeyanandamoorthy Ms K Thangeswari, Amparai MP K.Pathmanathan and others participated in the meeting. Batticaloa-Amparai LTTE Special Commander Ramesh and Batticaloa-Amparai LTTE Head of Political Wing, E.Kausalyan also joined Thamilchelvan in the discussions. Others who participated in the meeting are Deputy Head of LTTE Political Wing, Thangan, Director of LTTE Planning Secretariat Thuyavan, J.KMaheswaran, former M.P.Chandranehru, MsYogambikai and Mr.Vivekanandan.